VOCALOID4 Tohoku Zunko basically takes over the voice qualities of VOCALOID3 Tohoku Zunko and is powered up with the new "Growl" function. 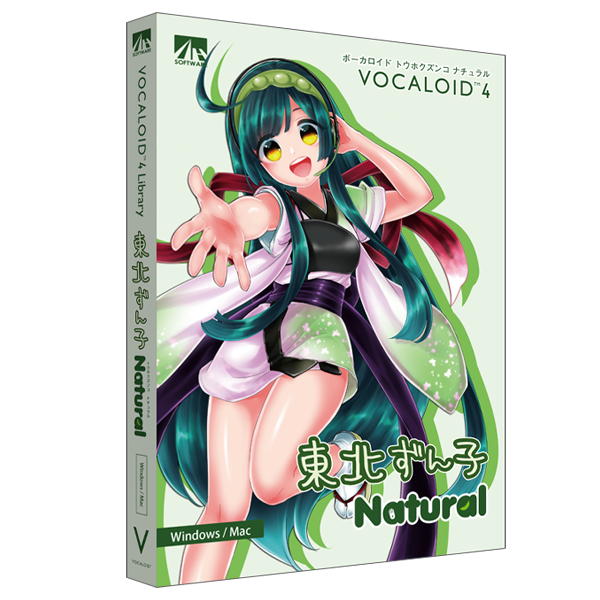 VOCALOID4 Tohoku Zunko Natural is made based on the voice samples of Satomi Sato, a very popular voice actress. Her voice is soft and gentle and suitable to various genres including pops and ballad. With VOCALOID4 new functions like Growl and enhancements, her voice sounds even more natural and human. Tohoku Zunko is a 17-year-old high school girl. Her hobby is to make Zunda (sweet green soybean paste) rice cake. Her dream is to have a Zunda shop in Akihabara. commercial use at no charge. stationary, mug cup, bus wrap design, taxi wrap design, Zunda rice cake, character figure and so on. The Zunko character is designed by Ninico Edomura, a very famous illustrator. TThis product includes extra contents including other software application in the data. For details, please go to the official product webpage. ●AHS Support Number: Needed to get support for your AHS product. ●Charamin Studio License Key: Needed to activate Charamin Studio. * AHS technical support is provided in Japanese. Copyright (C )2005-2016 AHS Co. Ltd. Copyright (C) 2016 SSS LLC. All Rights Reserved.